Once secure in its new university status in Providence, Johnson & Wales was ready to establish its first full campus beyond its home in Rhode Island. In April 1992 JWU leaders purchased the newly vacated North Miami General Hospital to house students and classrooms and within weeks bought an adjacent office building and parking garage. Donald McGregor, JD, left his post as vice president of administration and planning in Providence to lead the enterprise with a team that included Robert Nograd CMC, ’89 MS, ’99 Hon., Loreen Chant ’89 and Barry Vogel ’83, ’89 MS. In November, a culinary program opened with 81 students. By the following September, close to 400 students — 200 in residence — opened the campus. In the first year, facilities grew from one kitchen and one dining room to 7 kitchens, two dining rooms, a mixology lab, a meat cutting room and two baking and pastry shops. A hospitality program was launched in 1996, and in 1997 a College of Business began, offering 7 majors. A new century saw a master plan to transform the campus from a disparate collection of buildings into a campus community, and from a drive-through campus to a walking campus with student centers and green space. A renovated student dining center, The Mix, Tropical Pointe residence hall, the opening of Nograd Center and the 2007 construction of apedestrian mall between Tropical Pointe and Palm Gardens completed the plan’s first major components. By the close of a second decade, founding president McGregor had retired and passed the baton to President Chant. In 2011 Biscayne Commons residence hall was reconstructed and the opening of the new Wildcat Center created a home for a fitness center and the many athletics teams on campus as well as a hub of activity for its more than 2,100 students. In 2015, Larry Rice, EdD, ’90 was named president of the North Miami Campus, succeeding Loreen Chant. Rice, a Johnson & Wales graduate, academic leader and administrator, had formerly served as campus vice president and dean of academic affairs. He joined the North Miami Campus in 1993 as a faculty member. 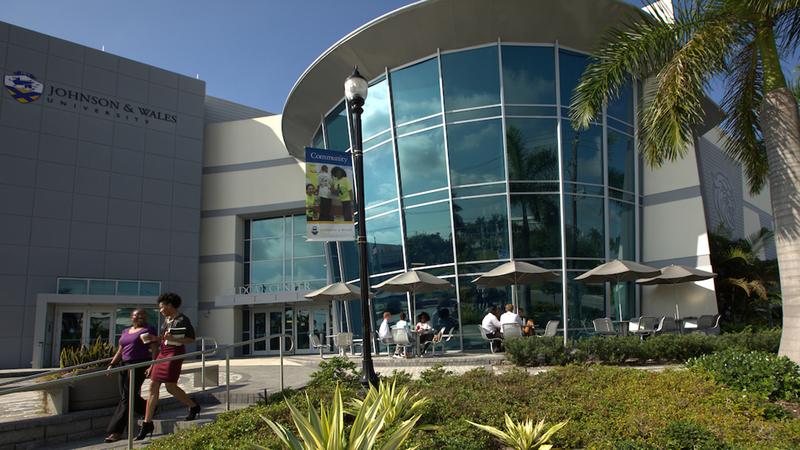 From a venture in culinary education built on a warm breeze and a visionary gamble, JWU’s North Miami Campus is now a center of higher education and community involvement celebrating 20 years of strategic growth.